We aim to teach children at The Firs about the privileged place we have in society and encourage them to develop a sense of care and responsibility for others. We are committed to supporting a number of charities on a regular basis. In recognition of the contribution we make to our community we recently received a MARSH Christian Charity Award to mark the work of the Firs Contact the Elderly group. Christ For All Andhra Pradesh – Christ For All In Andhra Pradesh was started with the aim of helping poor communities in the state of Andhra Pradesh, India. The vision of the ministry is to show the love of God to all people. Contact The Elderly – the only national charity solely dedicated to tackling loneliness and social isolation among older people. Supported by a network of volunteers, the charity organises monthly Sunday afternoon tea parties ,our tea parties are a real lifeline of friendship for our older guests who have little or no contact with family or friends. They bring people of all ages together, develop fulfilling friendships and support networks, and give everyone involved something to look forward to each month. The Trussell Food Bank – a Christian charity who are non-judgemental and inclusive, providing assistance to people of all backgrounds and all faiths or none who are found to be in genuine need. Save the Family – provides a safe, supported community for homeless and troubled families where safeguarding is paramount. Our vision is to keep families together and help them create a positive future. Banardos – works to transform the lives of vulnerable children and young people. Find out why we believe in children, our plans for the future and meet our Chief Executive and President. As well as our adopted charities, over the course of the year we support many others and partake in fun activities to help raise money. 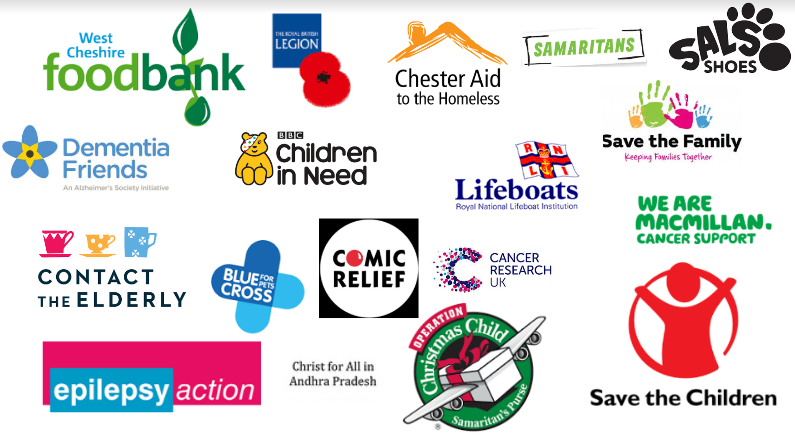 Some of the charities we have supported in the recent past are: RNLI, Christies Hospital, Operation Christmas Child – Shoe box appeal, Shelter, Clare House Children’s Hospice, Comic Relief, Children in Need, Alder Hey, RSPCA, Save the Children, NSPCC/Childline, Children Society, Macmillan.